The first year of undergraduate study is a daunting task. 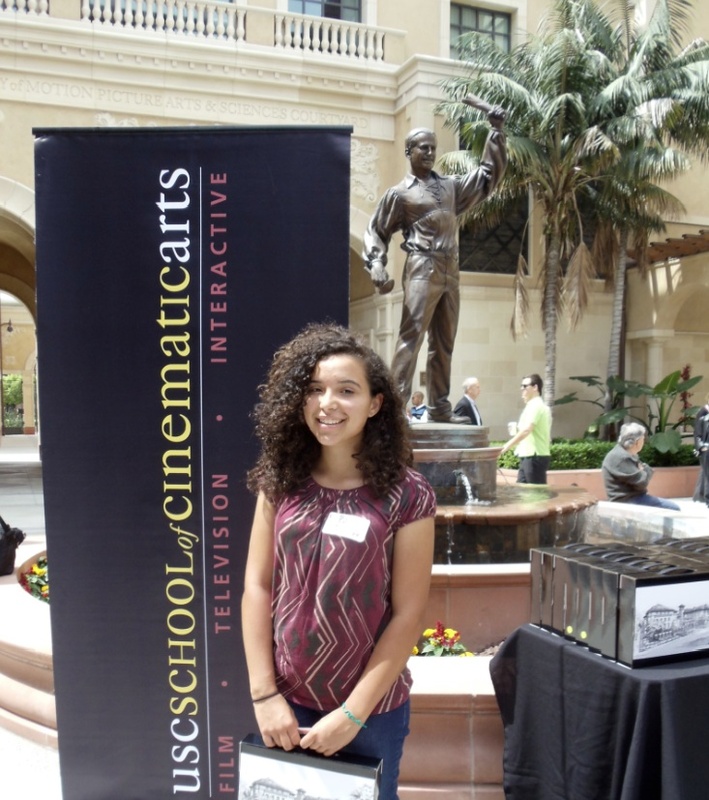 Between balancing an academic workload and a lifestyle overhaul, many incoming students to the USC School of Cinematic Arts can feel overwhelmed. Critical Studies freshman Brie DaSilveira recently sat down with SCA Family Stories to discuss her transition to college, how the alternate reality game Reality Ends Here helped her meet people from all the divisions and how incoming students can make the transition to SCA smoothly. Let’s start from the beginning. Why did you decide to come to the USC School of Cinematic Arts? BD:It was kind of a last minute decision. I had a choice of three schools and, based on financial aid, I wasn’t sure where I was going. I decided to follow what I truly wanted despite the costs or any other factors and I ended up here. I decided the day before the deadline. You are in the Critical Studies Division. Is that what you wanted to study from the beginning?I knew I wanted to go into some aspect of film. I wasn’t sure quite what. I actually realized, once I had been accepted, that this is where I needed to be. It’s my strength. Can you explain to someone on the outside exactly what the Critical Studies Division is?We get asked that a lot [laughter]. We’re not out to be film critics but we do analyze film, which is a really big part of the filmmaking process. It’s what distinguishes a good film from a bad film. It adds layers and depth that make a movie lasting – something that needs to be seen again and again. We analyze those types of ideas and theories. Do people assume you’re going into academia?Yes. You get asked if you want to be a professor. Most of the people I know just see Critical Studies as a foundation for all aspects of film. You can be a professor if you’d like to, of course, but it’s also good for production. There’s tons of stuff you can do. What were you expecting when you arrived at SCA? Were you intimidated? I was expecting to be wandering around being overwhelmed. Were you? A little. I think it had to do more with it being a new situation. I’m not used to being on my own or by myself. It was nice coming in with a bunch of other freshmen. We all figured it out together. Playing the Reality game helped a lot. I met a lot of other students at the cinema school. I know a bunch of screenwriters, a bunch of game people. If I had to do something different, I would have gotten involved in Reality from the very beginning. That’s something I regretted. I didn’t know what it was so I didn’t check it out. This is the alternate reality game Reality Ends Here, right? Yeah. I should have done more right off the bat with that. Without giving too much away, what’s the workload like for Critical Studies? It tends to be watching movies or videos or games multiple times for analysis. Then, writing papers or at least brainstorming about what the filmmaker’s intentions were in making the style or design or cinematic choices that they made. It’s fun but it’s lots of work. Did you find the lifestyle transition hard as well? It wasn’t too bad. I was ready to be on my own [laughter]. Honestly, the first couple of months are tough. Everyone is new. You miss your best friends from back home. I’m lucky because I only live a couple of hours away but I have plenty of friends who are international and I think that’s tough. I did some films in high school but they were more for fun. It blew me away. It also made me proud to be here. I might not be up to that level yet but I know I’ll get there. I’m surrounded by people that want me to get there. They’re trying to help me. The faculty or your classmates? Both. As a freshman, did you have [Dr. Drew] Casper? I did. I really like Dr. Casper. I’m also an office assistant so I work with him as well. I got to know him as a professor and on a person-to-person basis. He’s pretty consistent between the two. He is. He remembers my name. He does remember names so try not to mess up [laughter]. He does it to scare some people but I think he means well and he truly loves his students. It’s a class you have to take. For me it was a lot of fun. Some people get intimidated because he really knows his stuff and he loves film so much. It’s a vibe where you get into the, “I love film” mode just being around him. If you could give the class that’s coming in next year any advice, what would you tell them? Come in running. Do your research. Get online. Know where you classes are. Figure out things you want to get involved with, even if it’s not SCA. For the first couple of weeks, I was a little hermit and it wasn’t good. Things move fast. Get involved. What’s next for you? I’m taking Intro to TV. It’s similar to Casper’s class, I hear. I’m also taking some classes on sound. Production or Crit Studies?It’s production. I’m also taking a writing class. And some classes on Portuguese culture. I’m half-Portuguese so I’m rounding out my classes. It’s going to be fun.